Providence Catholic School, a college preparatory institution for young women, which is sponsored by the Congregation of Divine Providence, provides a program of academic excellence grounded in faith and trust in a Provident God. Providence prepares young women of diverse backgrounds for the world of tomorrow and encourages them to develop intellectual curiosity, deepen their faith, practice integrity, and seek justice. 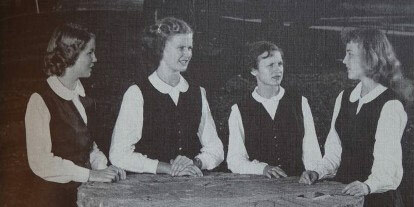 Providence High School was established in 1951, as a private, Catholic secondary institution separately incorporated and governed by a Board of Directors. In 2005 the school expanded to include middle school grades 6-8 and the name was changed to Providence Catholic School. The school is situated on three acres of historically significant property in downtown San Antonio and is accredited by the Texas Catholic Conference Education Department and Southern Association for Colleges and Schools. A Providence education fosters academic excellence through a rigorous program of study tempered by support and love which prepares each student to succeed personally, professionally, and spiritually. The curricular, co-curricular, and extra-curricular programs encourage the development of leadership potential in all students. Excellence requires commitment, dedication and focus. Families play a proactive, collaborative role in the successful education of their daughters. The Providence community engages in constant learning. Nurturing the faith of students through prayer, theological studies, retreats, and service fosters a sense of community. Our learning environment promotes self-respect and self-confidence, while supporting the development of each girl's talents. The learner is at the center of the teaching / learning process. Students learn to critically assess their choices and accept responsibility for their actions. All students should be respected as unique and valuable with God-given talents and potential for success. Students should be informed of the needs in the local and global community. Students are given the opportunities to be active participants in seeking justice, peace, and freedom. Inclusivity and diversity are integral to our community. Respectful teaching provides both challenge and praise. Learning best happens in a safe environment of mutual trust, fairness, respect and support.